When I wrote about my first encounter with modern hexies, I figured there would be more in my future. Maybe not many, but some. I had an equal amount of the gray Sketch for another backing as well as plenty more hexies basted up. I kind of wanted to try a different layout, but I loved the first so much I just did it again. I had in mind to orient the second grouping the opposite way and make a 'pair'. Except I miscalculated on where I began my gluing (how? why? ), so it's not quite the image I had hoped for. But you get the idea. Overall this time went much smoother. At Nicole/Modern Handcraft's suggestion, I got a Fineline tip for my glue bottle and that made things a lot less messy. I bought a pack from Alyssa/Pile O'Fabric and used the 'super flow' one, which was still a pretty fine line. On a side note, Alyssa has a really terrific shop - oodles of quilting and bag-making supplies in addition to beautifully curated fabric and lots of patterns. Anyway, the finer glue tip really helped and I had those babies glued down in no time. Quilting was equally quick and fun as before. I love the look when finished! Personally, the quilting's what 'makes' this technique, for me anyway. So again, the hexies were a mix of Kate Spain's Sunnyside and Cuzco - don't they go great together? And binding was also Carolyn Friedlander's Crosshatch, but this time in Tangerine. And it finished at 18"x22" - such a fun and manageable size to qualify as a quick project once you have your hexies ready to go. So I think that'll be it for my little foray into modern hexies, at least for a while. I'll keep adding to my Modern Hexies Pinterest board, and who knows? I might be inspired to give them another go. They make a fantastic matching duo of minis! I really want to try to technique! 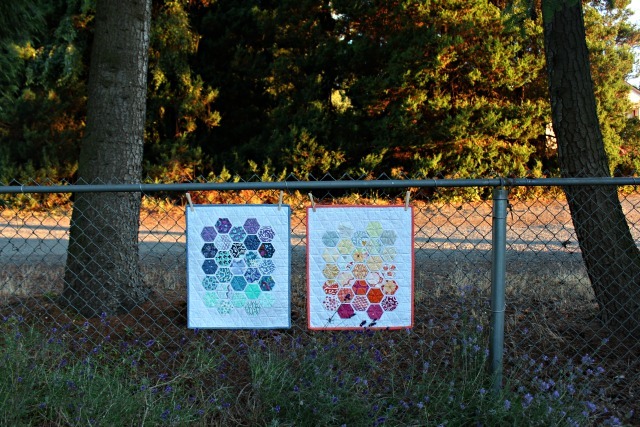 What if you made the hexies much bigger and made a larger quilt? These are great fun. Love these! We were just talking about these in a guild meeting. 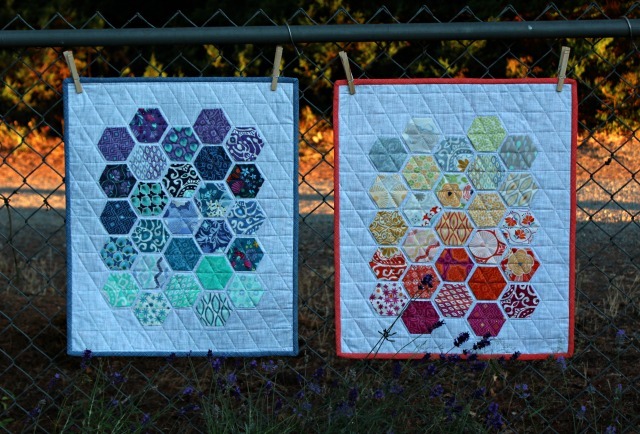 Do you back your hexies with a stabilizer before quilting them down or just glue the blasted hexies down? Just went to your original post and got my answer -guess I should have looked there first. Thanks. I love how you set up the color gradients. Kate Spain's fabrics really shine here! Beautiful! I love this! 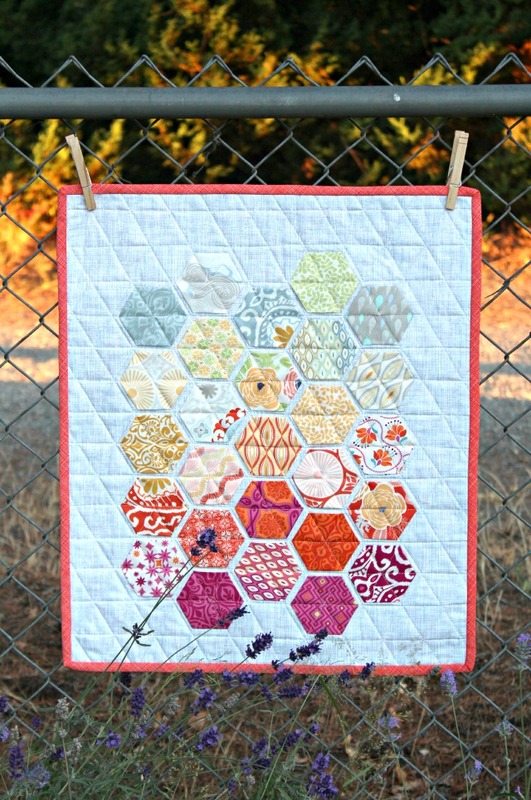 Would the same quilting work on a larger quilt or should I attempt to stitch each hexie down? YIKES! Annette, I usually email folks back, but I didn't see an email for you, so I hope you check back here....According to Nicole/Modern Handcraft, since the hexies are glued down with fabric glue + stitched, it should work on a larger quilt. You might ask her what she has actually tried. 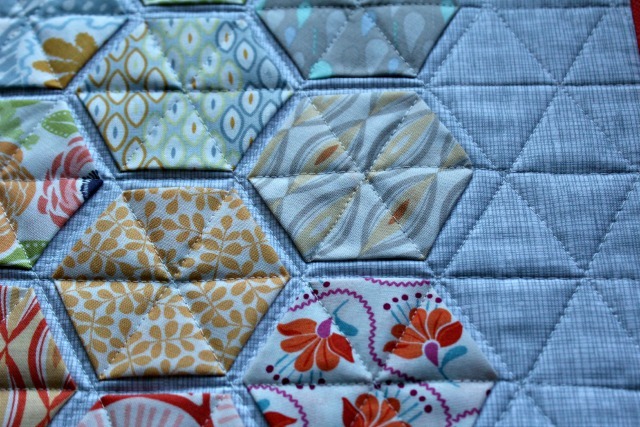 Personally, I think this kind of quilting that results in those triangles is what makes the quilt. I'm not sure if I'd like it as well with each hexie stitched down - thoughts? I think I fixed the reply issue. Imagine all the giveaways I've won and didn't know about! I completely agree about the quilting and didn't realize the Fabric Fusion was permanent. I'm going to give it a shot! I saw you posted this on IG and had to pop over to see how you did them. They are super cute! Oh, double the delight! Okay, Debbie you just keep tempting me to give these a whirl by showing your fantastic hexie finishes. They are both so gorgeous! Thanks too for the tip about the glue (and where to find it!). This mini is on my to-do list. I have scraps of Denise Schmidt Chicopee that I can't bear to lose so this may be a perfect way to use them up!